Today I am finally ready to tell you the story of my client and friend Katelyn. She is embarking on her first year of college this fall at Claremont McKenna, and where she will continue her soccer career. She came to me as a scrappy, enthusiastic, strong and compassionate 13 year old playing forward for the Blue Cats, a mediocre select soccer team. Of course one of the first questions I asked was whose idea was it to train….yours or your parents? She replied, “both!” Her parents were interested in strength conditioning training and looking for advice on the level in which she should be playing. Katelyn, on the other hand, wanted to be a faster, stronger soccer player. During our sessions her work ethic was beyond most teens. I quickly realized after going to a game and seeing her score a hat trick (3 goals), complete an assist and bend some beautiful corner kicks ALL IN ONE GAME that she was an exceptional athlete. She was on a team with her close friends and had been since the ripe age of 9. However, Katelyn was faster, stronger and understood the game better than most of her teammates…in my mind she was ready to move on…. But besides achieving all of the fitness goals that she set over the years (at a young age!) one remarkable accomplishment really stands out: her courage and ability to take a (calculated) risk. Convincing a 13 year old to leave her close friends is not an easy task, but this is not your average kid! 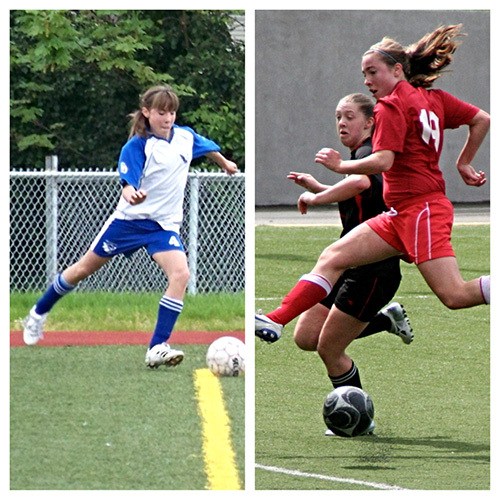 After 3 years of playing select soccer she found the courage to make a change for the better and her parents were willing to make the commitment to a higher level of soccer. Being willing to change what isn’t working is a very difficult thing. Eventually she outgrew this team and was ready to move on again; this time to play at the highest level……she was again faced with some difficult decisions. She asked herself where she wanted to be and why she wasn’t there. This is an 18 year old!!!!!! How many people (grown adults) do you know that say no to achievement everyday? They are afraid and have excuses but not Katelyn…… I was blown away.